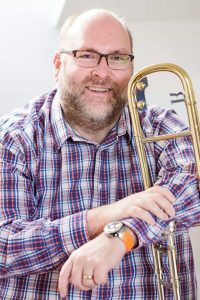 The Skelmanthorpe Band are delighted to announce the signing of Damian Hall as their new Solo Trombone Player.
. After a long break from banding Damian was inspired to play again, having some wonderful experiences with Wakefield Metropolitan, Stannington and more recently Boarshurst. Damian will make his debut with the band at their next concert on April 6th with the Black Dyke Trombone Quartets in Huddersfield.